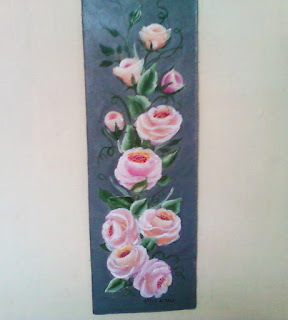 One stroke decorative painting has enthralled me totally and I spend most of my free time painting and watching videos of the same.This rose panel is a result of my pastime! Luckily I have found a tiny framing shop which has small leftover odd pieces of hardboard gathering dust. The owner is happy to sell them and it suits me as I want to paint several small projects instead of a single large one. These roses started of as regular pink white ones which I have been diligently painting, but changed color after two days! Acrylic paints are so versatile that its easy to paint over and change the color scheme. I wanted a pale pink yellowish shade for these roses and started by painting over one pink rose and a few buds. Later I liked the shade so much that I painted all of them in the same shade!